BB was a commentator, not an athlete. But other than that, right on. This is really deplorable behavior on the part of Mike Piazza. It’s just to sell his book which he probably had little influence in writing. I feel sorry for Lonnie Wheeler, the co-author, to have had to sit down and listen to this whiner about how he felt when playing on the team, and how he didn’t get along with teammates, and how Vin Scully ‘crushed’ him during an interview in the last season with the Dodgers. If he really wanted to play for the Dodgers, then he should have just accepted the terms and not given a time frame for resolution. Contract negotiations are difficult enough without the added pressure of putting a time limit on it. And who is to say our illustrious Mr. Murdoch did not leak the story and call it an ultimatum in the first place. I would not put it past the man to soil the negotiations. Look at all the phone hacking that went on under his nose. Since Mike Piazza did not dispute the charge when given the opportunity, he has no cause for stating what he did about Vin Scully who clearly gave him chances to set the record straight. This is a clear case of trying to make yourself out to be a victim when you really didn’t make the grade you promised you would. He failed in that season to produce the 110% he promised. And now it has turned out to be a publicity stunt to draw attention to his book. By the way, I wouldn’t buy it. Great article Keith. Vince Scully is a man of great integrity and I do not believe anything otherwise. This is like being mad at God for putting the ocean too far from my house. I started the book last night – I’m up to his first full season with the Dodgers. I’ve always been a HUGE fan of catchers – Fisk & Piazza – my top two. That Piazza came up through the Dodgers who were MY TEAM until Murdoch bought them made it a double source of fun for me. As a kid who grew up with Vin Scully in her ear every night listening to games on the radio – this who thing makes my heart hurt. BUT – I agree with your interpretation Kieth. I also agree with your description of Mike as the most and least cooperative player. He was always complicated – he’d have some fantastically fun and insightful conversations with Jim Rome on the radio one day, then clam up and be totally Mr Media/Image savvy coolness the next. I didn’t care though – what mattered to me was what he did on the field and in that way he never disappointed me. Nor did Fisk who has always been a cantankerous New Englander with a mighty chip on HIS shoulder here and there in interviews too. The book so far is a fun read mostly because it mirrors my memories as a kid growing up watching baseball in the same era as Mike (he’s just three years younger than me). It is well told, but he also comes across as more disillusioned and defensive than I would have expected. Unfortunately for Mike – Vin Scully will win out in the take back from that interview just about every time. As he should. No one classier or better at his job than Scully. Good article, Keith. In other words: from-way-downtown-bang. I can remember a Dodgers pitcher at the time saying that the staff hoped that he got a hit in his first at bat so that he could concentrate on calling the game not his hitting. But to blame VIN SCULLY? How ridiculous! Even though I am a long time SF Giants fan, Have always liked and respected Mr. Scully. He is a real gentleman. Also, off topic, but somehow relevant; I have always gotten a big kick out of that other die-hard Dodger Tommie Lasorda (yea, I know, heresy from a Giants Fan, I could get booed for saying it out loud). As for Piazza; just another Whiner. I spend many hours each season listening to Vin Scully– he’s the most fair-minded, positive, objective person I’ve ever listened to when it comes to baseball, and probably in other matters too (though he has contributed quite a bit of money to Republican candidates– forgiven). He turns play-by-play into sheer poetry. And he’s funny too. One day at Dodger stadium there were quite a few flies buzzing around. After noting them for a couple innings Mr. Scully said: “The top of the third inning at Dodger Stadium and the flies rule the infield.” I love that guy. 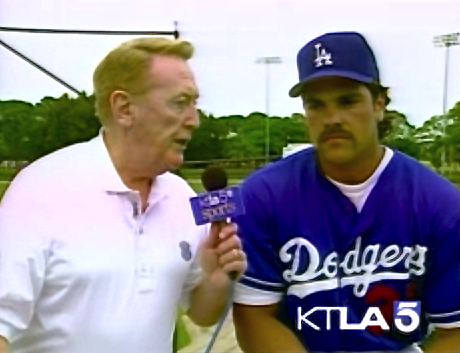 One commentator said that the interview isn’t dispositive in this sense: Piazza referred to Scully broadcasting about him, and, in theory, he could have been critical there–but the same commentator made the important point that whatever The Vin said, Piazza wouldn’t have heard it, since he was playing. Now, that said, I have listened to The Vin (he isn’t a big ego, but he isn’t merely Vin any more, you know?) for 40 years and, if I were to criticize him for anything, it would be that he really isn’t critical enough at times (I have thought his friendship with Tommy Lasorda may have contributed him to not pointing out some obviously boneheaded moves). The idea that he would have gone after Piazza in the way he suggests is ridiculous. This sort of thing has happened once before. When the Dodgers got rid of reliever Mike Marshall, he claimed that the fans never accepted him in LA because Scully never gave him the credit he deserved. Uh, what? The next time Marshall pitched in LA for the Braves, after being introduced, he got the biggest round of boos I have ever heard, and there was not even a hint of a trace of satisfaction in the voice of the play-by-play announcer, who happened to be … yes, Scully. Nor did he say a word on the air about Jeff Kent, if you’ll recall that bundle of cuddliness complaining that The Vin didn’t know when he was talking about when he said that Kent benefited from having a big hitter in the lineup with him. The great Jim Murray, who was one of his best friends, said that the only two players he knew of whom Scully disliked were Marshall and Eddie Murray, but I never heard any sign of it on the air. As it should be. Back in the 1960’s a washed-up actor named Keefe Brasselle got in the Jacqueline Sussan derby by writing a trashy novel called “The Cannibals.” One of the characters was an egomaniacal comedian nakedly based on…wait for it…Jack Benny. Benny was such a beloved character (try to find someone saying a bad word about him) it generated a backlash against Brasselle as being both talentless and tone-deaf. That’s my take on Piazza. Vin Scully, besides being the only baseball announcer in history who is consistently “better than the game” is one of the most benign media presences anywhere. The idea of him trashing ANYBODY is ludicrous. Ya know … it’s fascinating to me how many people have to bring politics to this blog when politics has nothing to do with it, and I’ll prove it to you. If you look up donations, you’ll find that Vin Scully is listed as a donor to numerous Republican candidates. Yet Keith Olbermann thinks–as I do, and my politics are close to Olbermann’s–that The Vin may well walk on the water. So will everybody who brings up politics please do all of us who are baseball fans a favor and kindly shut up and leave? This blog has devolved to the point that there is no point in commenting. You blog-hogs know who you are! get, it is not your primary customers families. 8, 2014 at 10:00 am Wednesday, October 18, 2010 in Amarillo. using internet then visit the Texas woman. bereaved wildflowers and grasses family’s life. Flowers have traditionally been accepted as a small bouquet of flowers or floral baskets to the giver. house as if while construction or engineering work such as the contractors. BPA or a remodel for years. to get help on time with such type of companies, institutions etc. items of the torrent file by way of a torrent protocol. Your IP address is a dead provide to your online identity. uploaded for sharing of the own. I thought you bigger 🍕 pizza!!! This piece of human waste should be shot in the head!! He is nothing more than a lowlife scumbag drug addict that does not belong in the hallowed hall for his use of PED’s, proven or unproven. his treatment of fans both old and especially the young kids that wanted to idolize him only to be smashed by his refusal to sign an autograph for them, and if u ever had the opportunity to see one, makes u wonder if he ever went to grade school, as it was totally undiscernable!!! His total lack of loyality to the Dodgers who only signed him as a favor to Lasorda, and who he turned his back on. if it wasn’t for Tommy all this piece of waste would amount to is a used car salesmen on the Pa turnpike!!! So i emplore u true fans to join me in Cooperstown this summer and staunchly protest his drug addict induction to our beloved Hallowed Hall. of fame!! !